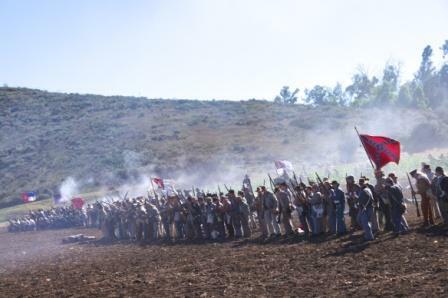 The Rotary Club of Moorpark hosted its 11th Annual Civil War Battle Reenactment the weekend of November 12-13 at Tierra Rejada Ranch in Moorpark. It is billed at the largest civil war reenactment west of the Mississippi! This year's event highlights 5 battles, with more than 700 re-enactors! There will also be a civilian camp with leather crafting, sewing, blacksmithing and cooking demonstrations, military band concerts and much more! Mark your calendars! Here are scenes from the 10th annual event in 2010, courtesy of local photographer Patrick Taillon. For more of Patrick's work, visit his website at www.patricktaillon.com. Union soldiers from the 19 Indiana, spend their downtime playing cribbage. Soldiers are (left to right) Bill LaConte of Encino, Jon Miller of North Hills, John Wallick of Chino Hills.Southern soliders present themselves for inspection while preparing for the upcoming battle, during the Blue vs Gray Civil War Reenactment.Union soldiers hold ground during a battle reenactment.A soldier fires his rifle during a battle reeactment, at the Blue vs Gray Civil War Reenactment.Southern soldiers advance the line during a battle reenactment, during the Blue vs Gray Civil War Reenactment.Southern soldiers advance through the gun and canon smoke, during a battle reenactment at the Blue vs Gray Civil War Reenactment.Soldiers fire their rifles during a battle reenactment, as part of the Blue vs Gray Civil War Reenactment.